Listen and learn from the best! Coxing audio at its finest. It’s here! 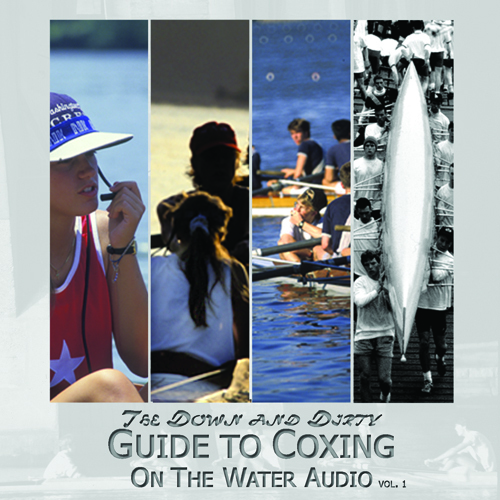 The Down and Dirty Guide to Coxing’s presents your chance to ride along with some of the best coxswains in the world. On The Water Audio puts you in the coxswain seats with U.S. National Team and NCAA champion coxswains during practices and races. You get to listen to how they direct, interact, and focus their crews. So if you have often wondered just what to say during a long piece, how to motivate a crew in a high stakes race, or how to keep it all together in the coxswain seat, this is your tool for success. The CD contains over 75 minutes of material in 10 tracks. Eight pages of liner notes provide bio’s on the coxswains, and additional thoughts on coxing and the important things you can learn from the listening to the coxswains on the disc. Below you will find the track listing for Volume 1 of the On The Water Audio cd. Included in this list is some additional information about the track including the location and some added details. I hope to add even more information about the tracks, mainly my impressions about each coxswain’s style and content, in the near future. Do you have any thoughts? Head over to the forums and give your input! Details: A very long and low practice working ratings between 16 and 18 spm. Working for precise blade work and matching between rowers while maintaining maximum power application. Low ratings of this variety are difficult and require tremendous focus. This is a snippet of a workout that lasted approximately 90 minutes. Details: A very long and low practice working ratings between 16 and 18 spm. The main difference between track 1 and 2 is the addition of the Women’s 4x in the practice. Mary works with her crew to race the 4x but without losing focus on what the technical goals are for the day. The key is moving the boat efficiently and making that the factor in their success over the other the boat. This is a snippet of a workout that lasted approximately 90 minutes. Details: One of the stops on the World Cup racing circuit which act as preparatory races for the World Championships. This is the heat in which the US 8+ faces some stiff international competition. The goal of the heat is to get out and feel out your competition. Set yourself up well and move on to the final. Mary’s excitment before and during the race is palatable and adds to her crew’s confidence. The crew won the heat. Details: This is the final for the this World Cup stop. Mary keeps the tension low before the start of this high stakes race. The American crew is pressed a bit but sticks to their race plan thanks to Mary’s control of the situation. Mary keeps her crew pushing and apprised of where their competition is all the way down the course. The recording fades out due to technical difficulties, but rest assured, Mary’s crew won. Details: We shift gears a bit and jump into a 2000 meter collegiate race. Kara’s style is much different than Mary’s but the goal is the same: get the most out of her crew as she can. The idea here is to stay focused on the techincal elements that the crew has had problems with during practice while racing the crew from Ohio. Once ahead, Kara knows she has to keep her crew focused on the goals specific to her boat and keep them pushing their limits. UVA won. Details: For those of you who wonder how to put together all the elements of coxing during a real long fall practice this is it. The ratings are higher than in Mary’s track so there is a slightly different focus. However, the goals are the same. Very technical, lots of feedback to the rowers, and aware of what is going on around them on the rest of the lake as well; listen when Sarah asks about a 4 also practicing- this is thinking ahead. Details: This track is an example of what it feels like at the start of a race. You can hear the announcer talking to several crews, Sarah interacting with her crew and the officials, and the general atmosphere at a big race. The main thing one can learn from this track is how things can go, and how you can keep your crew loose. Sarah keeps her crew calm and relaxed. You can hear the confidence in her voice. The start is clean and they are away. The track fades out, but rest assured Sarah’s crew won. Details: One of the coolest, most exciting races I have ever listened too. This is a neck and neck race for the EAWRC championship. Sarah wraps everything into one package to bring the gold home: tactics, attitude, skill. Details: This is a short track that simply gives another example of how to cox a basic practice piece. Rowing against another, slower, crew I had to keep my crew focused on the mechanics of the piece. One of the things I think you can also get from this piece is how you have to be in tune with your crew. I jumped into the coxswain seat for this practice. Even though I had coached them for months I never felt in tune and I feel like they might have done better with their regular coxswain. Coxing is more than technical calls and steering, it is building a bond with your crew so that they can feel confident whenever you make a call.